As I mentioned in Part The Second of my experience with the Volti Audio Vittoras, BorderPatrol's Gary Dews stole the Voltis from me. He's a cruel man, is Mr Dews, even if he is my wife's hero. As for me, I figured he owed me a follow up, so here it is. I’ve played a lot of female vocal, jazz and classical on the Volti’s since I’ve had them. Not that I don’t think they can play rock, they can, but I have subconsciously been playing other stuff. Classical, in particular, has been very rewarding. I often fall asleep when listening to classical on “conventional speakers” but there is something about the dynamics with horns that gives a real sense of a live performance and keeps me captivated. What has happened with horns in the past is that this affect thrills me for a couple of weeks, then all the colourations, bandwidth limitations, noise issues etc accumulate to piss me off and I stop using them. That has not happened with the Volti’s. I’m still listening and I’m still engrossed, regardless of music program. Is there cupped hands in the mid? Very occasionally but usually at higher than average listening levels. Has it stopped me playing tracks? Never! Its important to keep these things in proportion. Some people see a review of a horn system and as soon as the reviewer mentions cuppiness they stop reading. That would be their loss. I’ve had a lot of experience with horns. I won’t bore you with details of all the Lowther based atrocities I’ve encountered, both home made and commercial. Only two ever warranted serious consideration: Beauhorn and Hørning, and the Hørning was not a true horn. The rest were thrilling for 15mins and then …. Also, there is very little similarity between the Lowther type single drive unit horns and the multi-way compression driver types like the Vittora’s. I’ve also heard more than in enough Avantgarde systems too. Luckily for me, I have spent a lot of time with the Living Voice Air Partner and Air Scout/Tone Scout compression driver horns and a few home-brew copies my friends tried to make. The Vittora’s remind me a lot of the Living Voice Tone Scout/Air Scout: Similar size and efficiency, similar bandwidth, both very well integrated for horns, but there are some big differences too. The Vittora goes down further than the Scout but the Scout bass is the fastest I’ve ever heard, and it can really kick you in the chest. There is something very tactile about the Scout bass that the Vittora does not have. Imagine the thump in the chest that you get from a dynamic speaker coupled to horn speed and you get the picture. The front mounted woofer gave direct radiation and rearward into the horn and I’m sure that had something to do with it. however, I think the Vittora probably goes 10-20hz lower and that makes a big difference. The Vittora has better tonal uniformity and a lot less cabinet colouration. You can hear the metal mid-range horn on the Scout. There is a metallic colouration in the mid and a character difference as you go up from the wooden bass system to the metal mid-range. Mid range resolution, however, is better on the Scout. [Living Voice] used a Vitavox S2 [driver], which is probably the best compression driver I have ever heard, so the Scout has better mid range resolution than the Vittora but at the expense of the metallic character. There is a lot more woodiness in the Scout bass from the cabinet and that detracts a lot. The Vittora is refreshingly clean in this respect. The Living Voice ‘bin’ filled in from below the Scout (80Hz?) to somewhere around 45-50Hz. Not much on paper but it made a world of difference. It provided a foundation and substance to the music. Still not exactly floorboard shaking though, and modern music often did not translate. Overall the Scout+ Bin was one of the most thrilling and engaging systems I’ve ever heard. It could be totally captivating. The things it did well, it did so well there was a tendency to overlook the shortcomings. Compared to the Vittora it is more exciting but also much more coloured and I suspect that could become tiring over the long haul. The Vittora’s do loads of things right and very little wrong. I got them out of the van, unpacked and installed them by myself. It is not easy, but it is possible. I came up with a way to put the top hats on without damaging anything. I’m not trying to prove I’m superhuman or anything but …. My wife was fine till the sub-woofer appeared. It sat in the garage for the first couple of weeks. I was trying to get a handle on them without it and my experience with subs has mostly been negative so I was playing everything I had that didn’t need it: acoustic jazz, female vocal, Nick Drake, small scale chamber music etc. Eventually “Morcheeba withdrawal” kicked in, and I was really curious to try some Yello, so the sub came in. It was a doodle to set up. It’s the most effective and least sonically obtrusive sub I’ve come across. I hate the ones that play their own tune a fraction of a second behind the main speaker and never seem to integrate correctly. I would much rather live without, but the Volti one I only notice when it needs to do something. It is not physically unobtrusive however, and to make matters “worse”, I think it would be even better with two subs. This is pure conjecture, but I would love to hear it. Of course, this is more space …. Aside: My daughter misheard me when I was talking about the other crate in the garage, and started referring to it as the subterfuge. “So Dad, when are you going to put the other bit in, you know, the bit in the garage, the subterfuge?” Priceless! Thanks to Greg Roberts of Volti Audio for his generous support and loan of his outstanding loudspeakers. Thanks also to Gary Dews of BorderPatrol and my friend Kemper Holt for making the trip out to help my wimpy self get the Volti speakers in and set up — and taken down. As I hope you can tell, the Volti Audio Vittora loudspeakers were a whole lot of loudspeaker and I was delighted to spend the time with them. At some point, I’m going to have to re-investigate the whole “horn thing” and when I do, Greg will be on the must-call list. You can find Greg at various audio shows throughout the year, including AXPONA, Capital Audiofest and RMAF. As always, I can’t recommend enough going to check them out in person. I’m sure you’ll be impressed — but there’s just nothing like a live-and-in-person visit. Just don’t kick the tires. Greg may kill you. Volti also has a newsletter sign-up on his website. Check that out, too. You can find Volti Audio here. your wife doesn’t like the big Vittoras? Try the Altec A7 “Voice of the Theatre” system (30’W x 24″D x 54″T). Like your “Expedite” rack or multiple “Lack Racks” or whatever. How does it sound? A friend uses some A7’s every time he has a chance to. Often used as car speakers in his truck when camping or bringing a party along with him. The speaker components and horns are always protected from the environment. Any chance you might try the Alura from Volti? The new style has a smaller footprint. I’m wondering how well the bass integrates with the horn. It looks cool! No plans yet — first look I’ll get is at AXPONA. I recall sitting for quite a while when I 1st heard the Vittora spkrs at the second Cap Audiofest. Really nice. Scrunched into a room probably small for them, still sounded very nice. IMHO, I didn’t think they rivaled my personal favorite ‘horn loudsprecker’ … Avant Garde Duo’s, I heard in NYC years ago. I haven’t heard anything that came close to that day in NY. I’ve been chasing that sound ever sense… well, the PTE Phoenix spkrs are a very distant second. But, I digress. The Vittora’s are very nice. Don’t believe I’ve heard them with the sub. A nice write up on the speakers and the adventurous back story. what are your room dimensions? 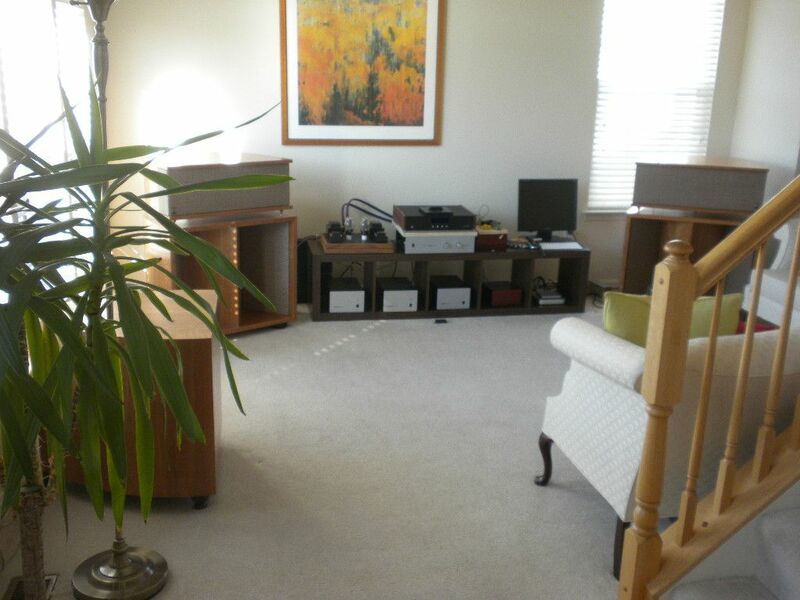 I haven’t considered large-ish loudspeakers in my 12′ X 19′ open dining/living room but could be persuaded…. Currently I’m finishing off a review of some quite nice small stand-mount speakers and stumbled across a pair of essentially free LS3/5A wannabees (just need to modify the enclosure and build some real crossovers for them a single cap/inductor doesn’t really cut it with the T27/B110 Kef drivers). If I could afford them I’d love a set of big horns. Depends on the room — my living room is 15×24.